Long ago, when First Man and First Woman emerged from the Earth, the goddess Spider Woman taught them how to weave. She constructed a loom from the sky, with sunrays, crystal, and lightning. The weaving tools were made from shells and sun halos. The spindles were made from lightning, precious stones, and abalone shell. She left our first parents with a promise – if they continued to weave, they would always be able to feed and clothe their children. For Native American tribes, like the Navajo, or Dine’ as they prefer to be called, it is of utmost importance that the universe be kept in balance. This is the sacred task of Spider Woman and her cosmic web. She is one of the most fascinating figures in their varied and complex creation stories. Spider Woman is a sort of spiritual midwife, a guardian who helped in the evolution of the First People. Through their many cycles of migration, she taught them how to ‘walk in beauty‘. That is, how to create and live in harmony with all that’s around them. Spider Woman mystically weaves together the material and spiritual worlds. Connecting everything to a central Source, and to each other, through the delicate threads of her silken web. The legends say that as long as people take care of that interconnectedness, they will thrive. It’s thanks to Spider Woman that humans, as we now recognise them, survived previous existences of chaos and disorder to emerge into this bright, beautiful present. A reality of miraculous contrasts that’s also known as the Glittering World. 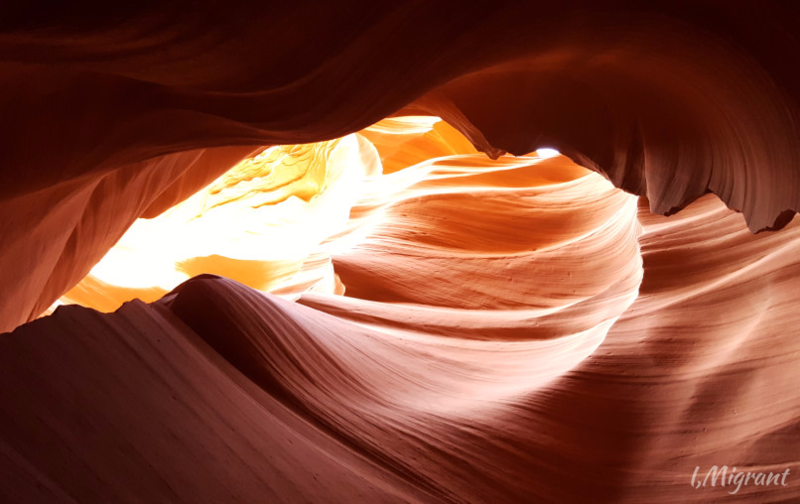 Sunlight streaming through a sandstone slot canyon estimated to be thousands of years old. Page, Arizona. It was difficult to tell how old she was. Perched on a tall stool, she was hunched over a small desk. Her dark blonde hair – loosely pulled back, and her deeply-toned skin – as rugged and ruddy as the mesa that surrounded us. Her piercing obsidian eyes hung muted like well-worn embellishments on undernourished topography. Then, she smiled, and her face crackled to life as if sprinkled with the gold of desert sands being kissed by sunlight. “Is this your first time in Page?” she asked, launching into a welcome spiel without waiting for an answer. Her pride in her home town was as tangible as the rough terrain starkly visible through the shop’s tinted glass door. “Yeah, this weather will do it to you. Our skin gets so dry no amount of moisturizer helps,” she offered, still smiling. “No joke – you step out of the shower here and you won’t need a towel.” She laughed. Debbie, as she later introduced herself, was more than happy to talk about life within the invisible borders of her ‘made-up’ town. It hadn’t existed for very long. Created in 1957, Page was a temporary camp for workers building a massive dam and water reservoir for the southwestern states. 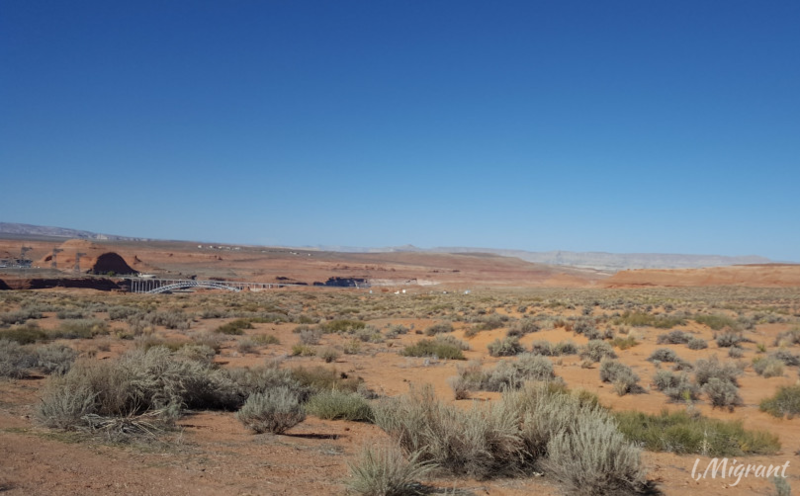 It was set up on the northern tip of Arizona, near the Colorado River, on 62 square kilometres (24 square miles) of Navajo land that were exchanged with a larger tract in neighbouring Utah. There are less than 8,000 people now living in Page, but it sees some 3 million visitors a year. 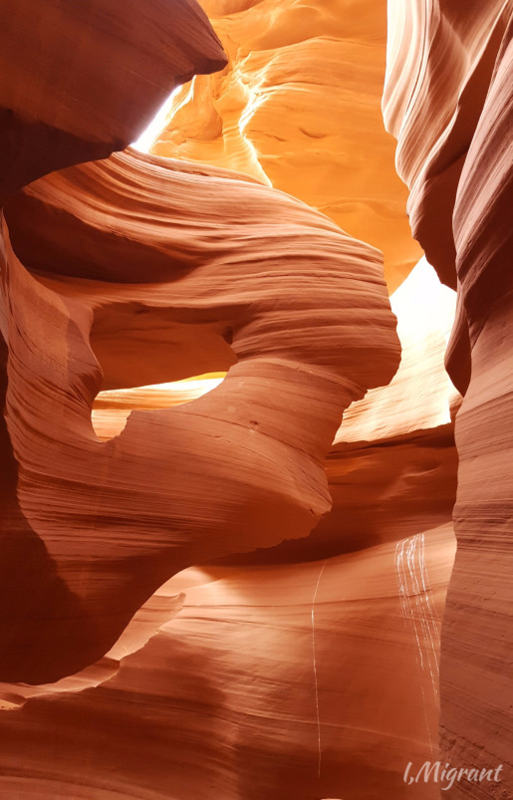 Aside from the stunning Grand Canyon, which is less than 200 kilometres away, Page’s ancient sandstone terrain offers two of the most photographed landmarks in the modern world — Antelope Canyon and Horseshoe Bend. 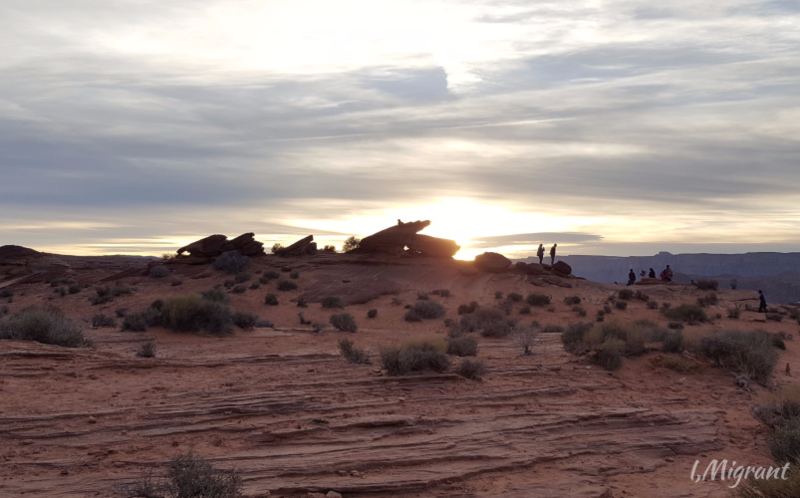 Tourists waiting for the sun to set over Horseshoe Bend. Just south of Page, it’s now among the most popular destinations in Arizona because of attention on the internet. “I was born and raised here, never saw a need to leave,” Debbie stated. She’s one of the many ‘whites’ who live in Page. At nearly 58% of the population, they’re the majority. The Native American Dine’ are the second largest group at around 35%. 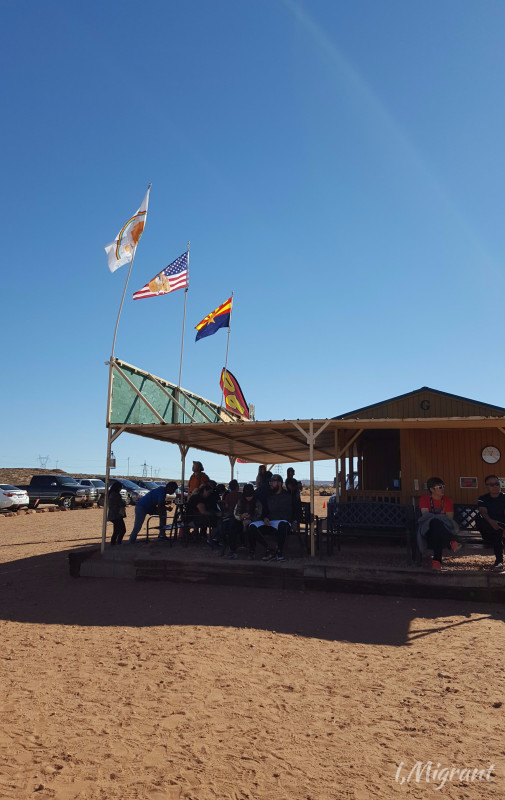 The three flags of Page: 1 representing the semi-autonomous Navajo nation; 1 for the state of Arizona; and the national flag of the United States. The Navajo or Dine’ are the original settlers in this part of the Southwestern United States. Their ancestors migrated across land bridges over 40,000 years ago from what is now known as Asia. After the Europeans arrived in the 1500s, the Native American population was over-taken and tribal sovereignty eroded. Now, the largest of all native tribes is the Dine’, which numbers around 250,000. Their semi-autonomous nation sits on 16 million acres of land with vast reserves of oil, uranium, coal, and natural gas. But poverty and unemployment are high. Navajoland stretches across three states within the borders of the federal United States. There is a deep, painful history between the two nations, and an on-going relationship as complex and variegated as the blood red landscape it springs from. 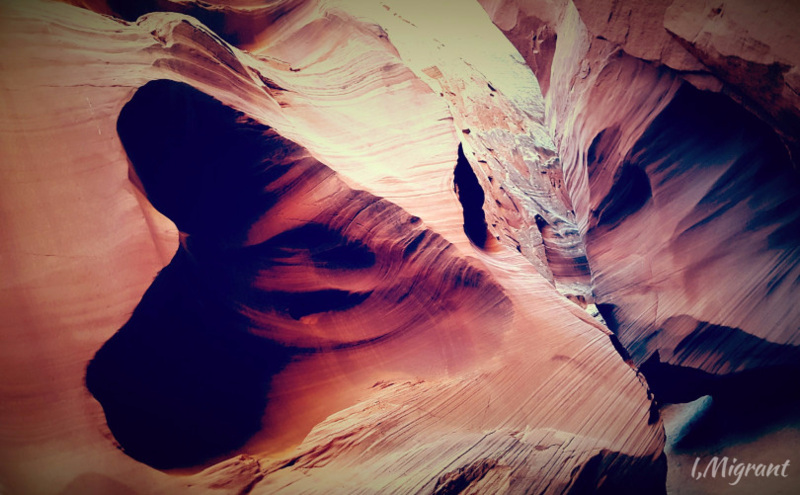 The amazing contours in Lower Antelope Canyon. Page, Arizona. It’s the textures of Arizona’s landscape that stay with you. Like a caress long after the beloved’s gone. They’re enthralling – the different shades of red that shine in a variety of glints under the blazing late afternoon sun. Speckled as they are with the lustre of deep blue foliage and sapphire green waters. The burnished geologic tapestry is as mesmerisingly soothing as the feel of the Dine”s woven rugs. 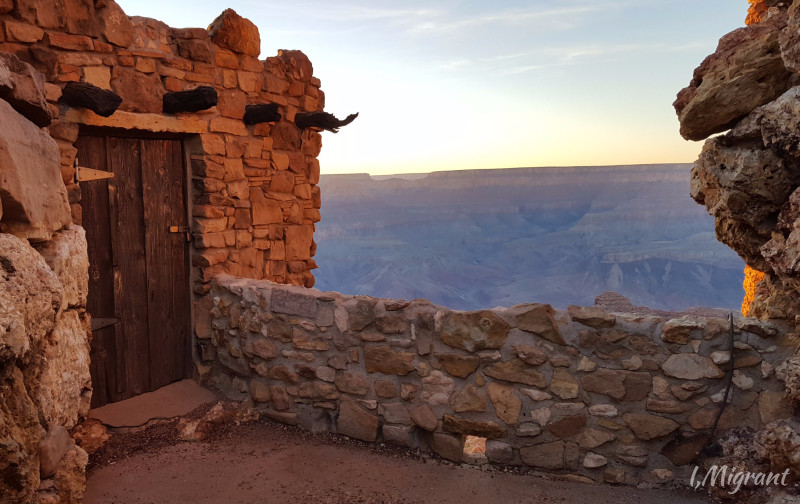 The Grand Canyon, one of the most visited parks in the U.S, sees more than 5 million visitors a year. Its eastern section borders the Navajo Nation. No wonder, then, that red traditionally symbolises beauty. In Dine’ weaving, it is the colour of sunlight, a reference to the gods. Here, it can feel as if the only way to track time is through the slow dance of Red across the robust landscape. In a town like Page, that landscape stretches as far as the eye can see, making it easy to think nothing else exists except what’s here. Because “here” seems to reach towards eternity, it can make it impossible to see beyond the red. Woman in the Wind. 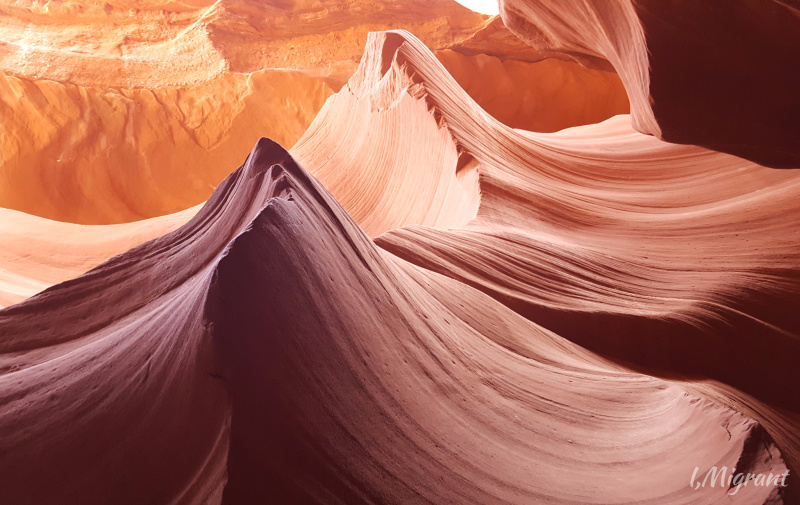 Lower Antelope Canyon. 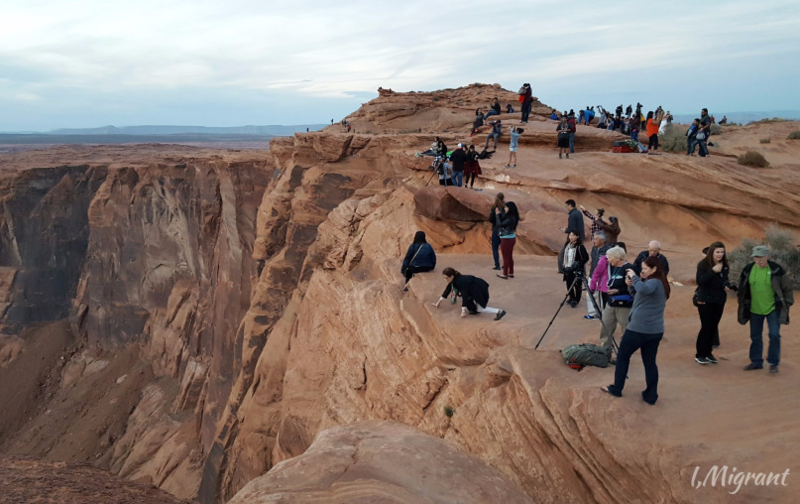 The canyons were formed by the erosion of sandstone due to rain and flash flooding. Over time, the waters smoothed hard edges making the rocks look as if they are flowing. “Our kids are now out of the house, so we finally took a road trip,” Debbie exclaimed, ecstatically. It was as if she had travelled to another world. It was the first time she saw fog, she intimated. And the ocean. But something else fascinated Debbie more. The journey surprised and pleased her, but as much as she enjoyed seeing the green and the blue that lay beyond Arizona, Debbie was happy to be home. Golden hour on the approach to Horseshoe Bend. Also glad to be home was James. In his mid-forties, and a “half-breed”. That’s what he called himself. James is half-white, half-Dine’. He tried to make light of it, but there was a certain palpable tension in his tone. He had clear eyes and relatively pale skin; it revealed how recently he had returned to this land of the burning sun. 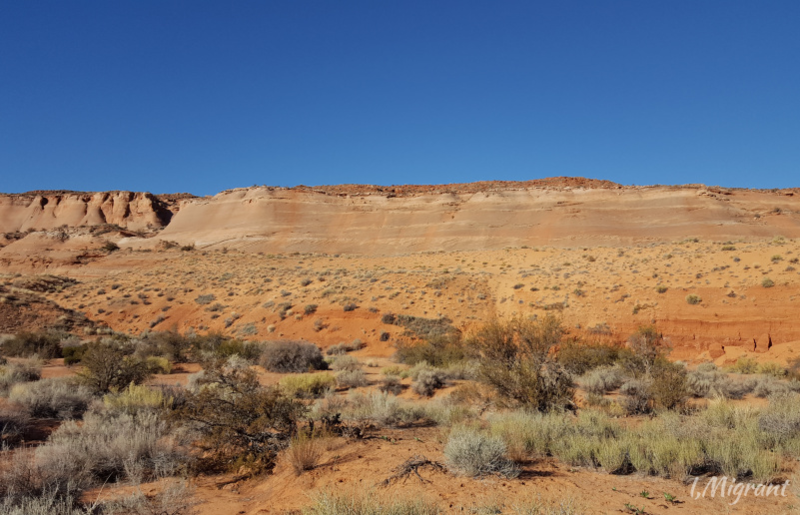 As we walked around Navajoland under his guidance, James showed us the different plants that could be used to treat a variety of ailments — from headaches to fever, or joint pain. Even insomnia. We presumed it was knowledge gained at the feet of his mother, who was Dine’, but presumptions are seldom right. James learned about the medicinal quality of herbs working as a chef in Texas. That was his “ultimate dream,” he confided, with more than a slight trace of melancholy. “But it was time to come home,” he repeated. James spoke of his mother fondly, and told tales of a childhood where he and his siblings watched as she washed her hair with leaves. James looked out at the vast scenery around him and confessed that he didn’t know what lay ahead. There didn’t seem to be many options in Page. You either worked in tourism, or you worked for the power plant. James stared at the horizon in silence. A heartbeat. And then, he walked on. Across from the 3 flags used by Navajo Nation are the so-called “3 Sisters”. They’re the stacks of the power plant that dominates many aspects of life here. 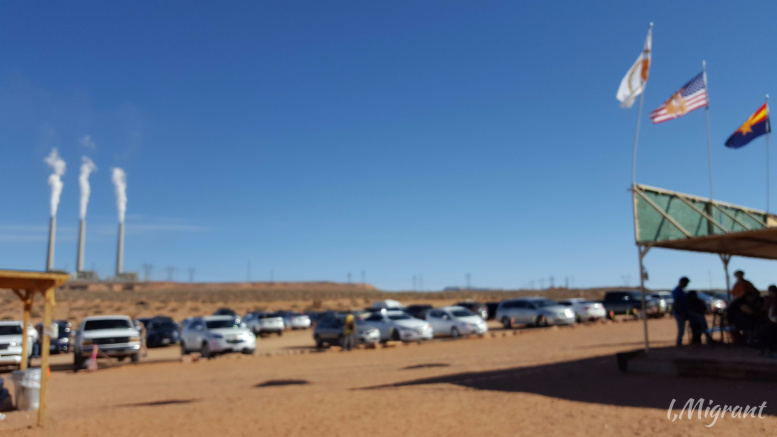 In Navajoland, just outside of Page, is the largest coal-fired power plant in the Western U.S. It’s the economic backbone of the tribe’s reservation. But its state operators now plan to close it much earlier than expected, leaving many Dine’ families anxious and devastated. We watched the sun set over Horseshoe Bend that afternoon. Among the crowd of visitors, was a young woman in a hijab wearing a California state basketball t-shirt. It was an unusual sight. She was smiling as she walked, confidently and unbowed, in a land that’s a testament to harmony and migration. 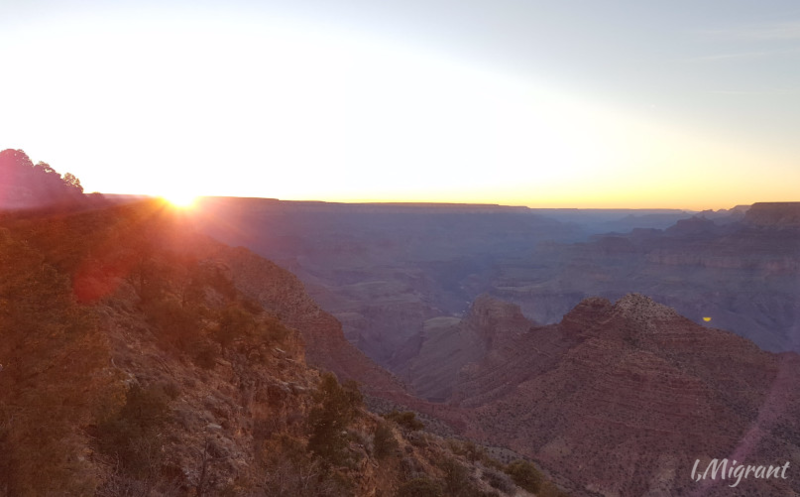 Grand Canyon is one of the Eight Natural Wonders of the World, and a UNESCO World Hertage Site. There is an other-worldly energy that emanates from this red soil. A power that goes beyond a coal-fired, hydro-electric, pupose-built town in Northern Arizona. A surreal force above the many churches that line its one main street. Beyond this Red, there is much inescapable anger, and hatred, and animosity. People seem to have forgotten that life is full of wonder, if you stay open. If we are welcoming instead of closed off. If we remember Spider Woman, and try to find beauty in our current, imbalanced, embattled world. 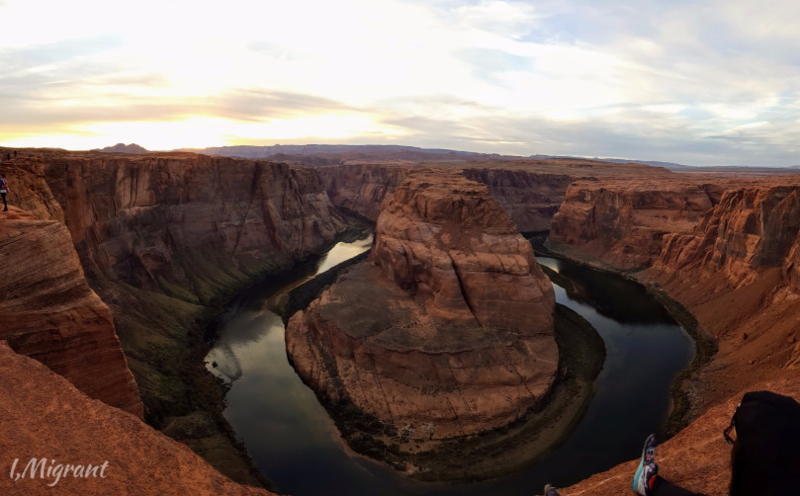 We watched the sun set at Horseshoe Bend with a young woman in a hijab wearing a basketball t-shirt. Debbie is glad to be home. James is looking for another dream. We are all more than what we might first seem. 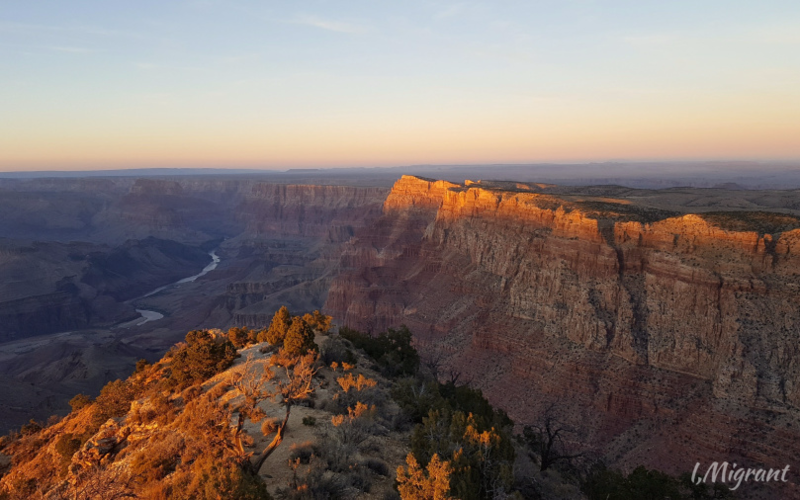 Each of us tapestries as rich and rugged as the textured landscape of the Grand Canyon. As robust and colourful as a Navajo rug. Dine’ weavers don’t plan their designs. Spider Woman taught them that the pattern will reveal itself as they go along. This wondrous corner of our fragmented world is just one of many places that can remind us we are all precious threads in an unfinished grand design. A slot canyon in Navajoland. It is finished, again, in beauty. Marga Ortigas is a media strategist and former international broadcast journalist who has covered stories across Asia, Europe, the Americas, and the Middle East. I am deeply moved by this piece. Please keep writing, and keep sharing. Thank you. Appreciate your taking the time. Beautiful! You make me feel like I am there.